﻿ DRAGON SWORD AND WIND CHILD « Haikasoru: Space Opera. Dark Fantasy. Hard Science. The God of Light and the Goddess of Darkness have waged a ruthless war across the land of Toyoashihara for generations. But for fifteen-year-old Saya, the war is far away—until the day she discovers that she is the reincarnation of the Water Maiden and a princess of the Children of the Dark. Raised to love the Light and detest the Dark, Saya must come to terms with her heritage even as the Light and Dark both seek to claim her, for she is the only mortal who an awaken the legendary Dragon Sword, the weapon destined to bring an end to he war. Can Saya make the choice between the Light and Dark, or is she doomed—like all the Water Maidens who came before her...? Tales of the Matagama come to ebook! Science Fiction versus Fantasy—The Giveaway Contest! Noriko Ogiwara was inspired to write by the classic Western children's books she read as she was growing up. 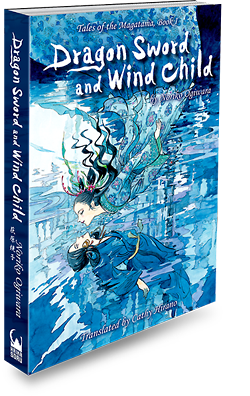 Dragon Sword and Wind Child is her first book and part of the awardwinning Magatama Trilogy. Her other books include The Good Witch of the West and Fuujin Hisho. Ogiwara makes her home in Japan. Saya walked along the river for one last look. Tomorrow she would leave. It was a clear, early summer evening before the start of the long rainy season. The willows with their leaves unfurled swayed in the wind and frogs croaked. The breeze already smelled of summer, heavy with the fragrance of deep green leaves and the scent of grass from the warm fields. The last rays of the sun rested on the tips of the mountains, and downstream the water gleamed red where it reflected the sky. Standing on the stones at the edge of the water with not a soul in sight, Saya strained to see the river’s end. How often she had played here; how often she had dreamed of places unknown, people unknown, gods unknown. On little leaf boats she had set her dreams sailing, never once thinking that she would leave this village. Mahoroba was said to lie far to the west of the end of the river. She had never before thought of its location in relation to her village. She had only imagined a misty palace somewhere far away in the direction she would now journey. She gave a small sigh and removed the magatama on its cord from around her neck. The sky-blue stone, warmed by her skin, seemed to breathe. She laid it in her right hand, as she had done so often, against the birthmark on her palm. She found it difficult to believe a baby could be born with this squeezed in its tiny fist. But she could not deny its beauty. How proud she would have been if only it had been a betrothal gift.